A part of Dubrovnik, Gruz, which is located about 2 km west of the Old Town, could be the ideal choice when choosing accommodation. The port is situated there from where you can take a ferry or catamaran to the nearby Elaphite islands, which are an ideal destination for a day trip by boat. The ferries to Mljet, Korcula, Hvar, Brac and Split as well Bari, in Italy, also set off from here. Cruise ships on Mediterranean cruises also anchor at this port. At the end of Gruz is the bus station with bus connections to all the big towns in Croatia as well as some abroad. A shuttle bus to the airport with departures all day long also leaves from this station. 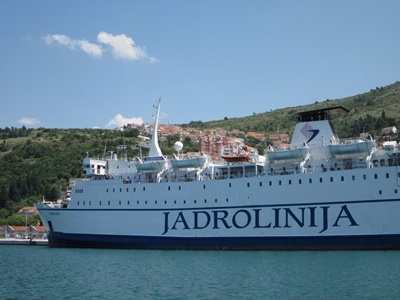 In the port building (a large building with the sign 'Port of Dubrovnik' opposite the Hotel Petka) is the Tourist Office where you can find a lot of information connected to Dubrovnik as well as buy the Dubrovnik Card with which you can save money during your trip to Dubrovnik. Along the coast in Gruz there are rent-a-car offices, exchange offices, tourist agencies, souvenir shops, small shops, bakeries, restaurants, café bars, department store, a chemist and many other facilities. Also there is the largest open market in Dubrovnik when you can buy supplies of fresh fruit and vegetables, freshly caught fish and other tasty seafood. 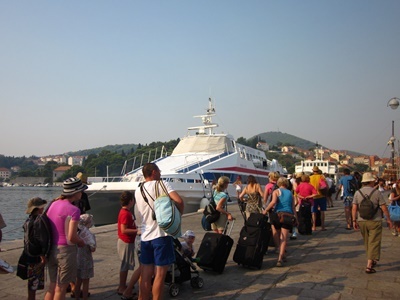 From Gruz you can easily walk to other parts of Dubrovnik or can take one of the town buses. To get to the Old Town you can take bus numbers 1A, 1B or 3, to get to Lapad where there are numerous beaches, take bus number 7, and to get to the cable car you can take bus number 8 in front of the department store. For more comfortable ride you can take a taxi from the taxi rank at the bus station of at the exit of the port itself (opposite the Jadrolinija office). If you are looking for hotel accommodation in Gruz you can choose between three hotels: Hotel Petka, Hotel Berkeley and Hotel Adria. 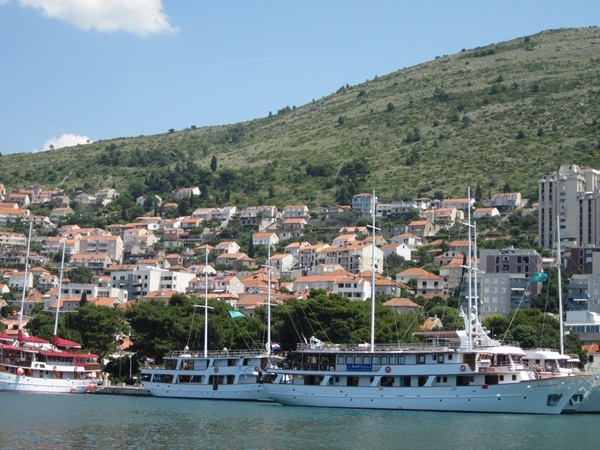 If you're looking for affordable accommodation near the port you choice would be the Hotel Petka. The Hotel Berkeley is a family-owned hotel that offers modernly equipped rooms and a delicious breakfast. The Hotel Adria is located in an elevated position below the Adriatic Highway and has comfortable rooms with a beautiful view of the port. Gruz also offers a large choice of private accommodation starting with rooms, hostels, guesthouses and apartments. These places are generally located in family houses and by staying here you will get to know the local population. Please take into account that you may have to walk uphill to some of these places since there are many steps.